Transform yourself into virtually any superhero and lead a crusade for justice with this collection of adult superhero costumes. Whether you want to be the caped crusader of Gotham or Metropolis's Man of Steel, this collection is bound to have what you're looking for. These costumes come in a variety of sizes and price ranges, so you're sure to find the perfect superhero costume. 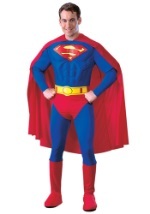 Deal out some justice this Halloween with one of these adult superhero costumes.